Today I finished reading Hope for the Church, a less well-known title by Jurgen Moltmann. I probably wouldn't have even heard about it if it weren't for a random mention by Tony Jones (I honestly don't even remember where he posted it, probably Twitter, but he mentioned somewhere that he was reading this book). As if my affinity for Moltmann wasn't enough incentive, as soon as I heard the subtitle, "Moltmann in Dialogue with Practical Theology", I knew that had to get it and read it. Moltmann and Practical Theology!?!?!?!? Yes, please! 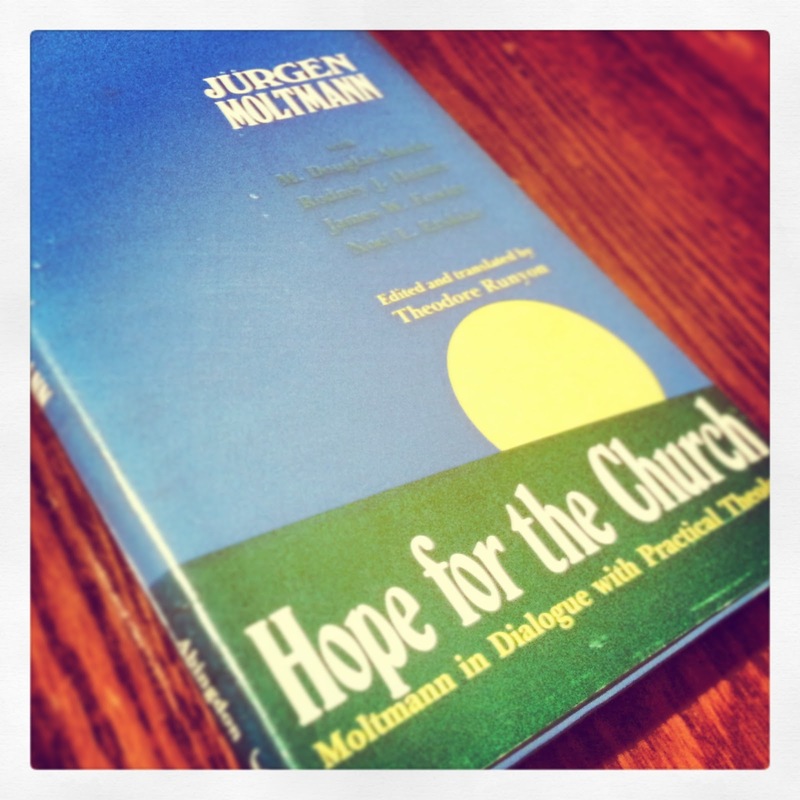 The book actually only contains three chapters from Moltmann himself, with dialogical chapters from one Moltmannian scholar, three champions of the practical-theological discipline, and an Introduction by Theodore Runyon. Moltmann provides one chapter with the broad thesis that "The local congregation is the future of the Church" (21). In "discipleship to the crucified Christ" and "in the context of the coming of God's Kingdom" (21) which is to be found among "the poor", namely those who are "excluded from normal society", the ministry of the church takes place (24-25). By these distinctions, the ministry of the church is a call for grassroots creative discipleship and it is specifically oriented toward the participation in suffering (31) and the anticipation of new life (36). This chapter is Moltmann's own summary of the implications of his Theology of hope (expressed in his whole corpus) for the ministry of the church. Following Moltmann's first chapter is a second chapter by Moltmann which speaks more specifically to implications for the sacramental and liturgical practices of the church (spoiler alert: Moltmann doesn't dig on infant baptism... who knew?!). Then there's an interesting chapter by M. Douglass Meeks on "Moltmann's Contribution to Practical Theology," which explains the distinctly Trinitarian quality of Moltmann's contribution. Then a chapter by Rodney J. Hunter (maybe my favorite other than Moltmann's) which talks about the contributions of Moltmann's theology of the cross to the discipline and theology of pastoral care, followed by James W. Fowler's chapter on Christian Education... maybe the weirdest chapter. Folwer talks about imagination and futurity in ways which appeal to Moltmann but make significant and seemingly naturalistic departures from his theology. After Folwer does his thing, Noel L. Erskine offers his explaination of the relationship between Moltmann's theology of hope, which in concrete ways looks to oppose the present forces of the status quo which oppose hope, and Black Theology. This chapter's fascinating because it frames Moltmann's theology in the Black Experience and makes critical comparisons between Moltmann and folks like James Cone. Erskine demonstrates that it's a shorter line from Moltmann to Cone than it is from most other white European theologians to Cone. Finally, the book concludes with a response from the man himself--Moltmann closes the dialogue with concluding remarks to each of the contributing authors' chapters. Hope for the Church was published in 1979 so, as you can imagine, some of it may be a little dated. Approaches to pastoral care and Christian education have surely (hopefully) seen some changes since then. But, remarkably, there's surprising contemporaneity between then & now and thus, the relevance of this book for contemporary practical theology is not undermined. Anyone who's interested in Moltmann's theology and anyone who cares about ministry and practical theology should definitely consider reading Hope for the Church.